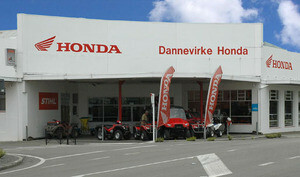 DANNEVIRKE HONDA, DANNEVIRKE - The place to go in Whangarei for Honda road bikes, dirt bikes and farm equipment. In addition, our experienced technicians look after bikes of all makes and models. Dannevirke Honda is located in Southern Hawkes Bay, nestled between Manawatu, Wairarapa and Hawkes Bay. At Dannevirke Honda we specialise in offering a range of new Honda Motorcycles, ATV's, MUV, Dirt and kids bikes. We also offer a range of second-hand motorcycles. Finance is available if required. Our Parts Department carries a comprehensive range of parts and accessories. Our Workshop.........In our workshop, our dedicated team are here to handle your service requirements, large or small. On going training means you can be assured of top class workmanship and a fast turnaround.